The Wild Hunt has begun! Here is the task list for the latest live event. The one in red is pretty interesting, as you can click on it. While nothing I have read or seen leads me to believe Aion will be a better large scale PvP game than WAR, there is one area it seems to be superior. It isn't very surprising, as players have been clamoring for it in WAR since before launch. The Abyss is a large zone filled with PvE content. 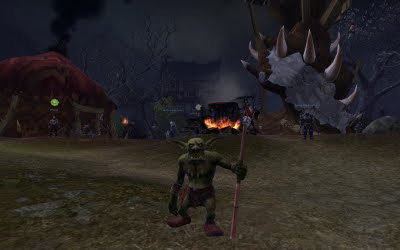 There are npc's to farm and repeatable quests to be run. All of which reward you with PvP points. 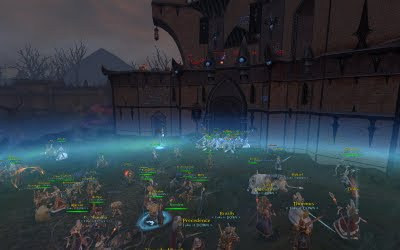 WAR has the Land of the Dead, which is also a PvE zone. However it is gated, so you will never find a lot of enemies there. Also, most of the content is group (or more) oriented. The PvE content in the abyss can be run by one or two players, which is sometimes what players like to do. This also enables the small group gankers, which is a larger population that I thought, to go out and find them. When they meet, PvP will happen.... sometimes. While Aion suffers from zergs, it does offer this small group alternative. Right now that option is missing in WAR. While I have not posted much about WAR lately, rest assured I still play almost daily. It was just there is a lot going on in the MMO world and it must be talked about! Anyway, back to WAR. Most of my time has been spent on alts lately. I still like my Engineer, but I have been in the mood for smaller scale combat. The lower tiers are more likely to have that as they are less populated. Don't get me wrong, I love a good massive fight but not all of the time. Healing can be pretty fun. I feel like I actually make a difference as opposed to when I am the Engineer. Let's see.... what else is going on with WAR. Patch 1.3.1. The city invasion patch hit the servers. Sadly it caused a whole mess of stability issues. I was lucky enough not to experience any of them. Cake. The Squig Cake was featured on Ace of Cakes last night. It is on my DVR and will be watched soon. I think the Food Network may put it online sometime as well. Am I the only one who thinks of Ace of Base? Dev Diary. The RvR Team Lead discusses the thought process behind the city sieges. Nothing is as easy as it sounds. Live Event. 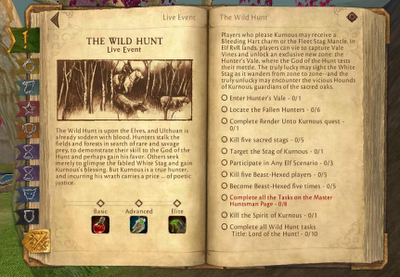 The Wild Hunt Live Event starts next week. I can't wait as these are always fun. Recently I saw an interview for Dawntide on Massively. This was the first I had heard of this MMO. Dawntide would classify as a sandbox MMO, as opposed to the mostly on-rails experience of WoW. There are a lot of MMO's you say? Well Dawntide is a bit different and worth keeping an eye on. Skill Based. No experience points here, you level up skill by doing them. 50 skills and options to customize your path. Be your own man (or woman). Want to just be a Blacksmith? Go for it. One of their tenets is to let the player be who they want to be in the game. NDA, nah. Dawntide is in early beta, but they have decided not to use a NDA. This sort of open development gives me more confidence in their efforts. Crafting. Finally another game is trying to make crafting as good as SWG. The type of materials you use will affect the final product. City Livin'. Players will be able to found and develop cities (again similar to SWG). This is another great feature that has fallen by the wayside. of course, this means player housing too. War. Territorial control will lead to conflict. To me this sounds like they will have areas similar to Eve null sec. Full looting is also planned, but there are safe areas. Sloop John B. Player boats are in the game. Only a few games have done this (Vanguard, Darkfall?) so far. Instancing, pass. There will be no instancing in Dawntide. Dawntide is still in the early stages, but seems to have a lot of potential. As there is no NDA it is worth keeping your eyes on. For more reading, I suggest Keens article or the Dawntide forums. "Just so everyone knows we are running a special to celebrate this release. From now until the end of the month you can get PlayOn for just $29.99. Just go to http://tiny.cc/C5WOJ and enter AUG10OFF in the coupon box to receive the special pricing. As always you can also try us for 14 days for free. Get the trial here http://tiny.cc/9kHC3. Hurry though, if you want the special pricing you need to buy before August 31st, 2009"
Disclaimer: While the link will have me as a reference in the url, I am not receiving anything from PlayON. I suspect it is just for tracking purposes. Problem. The current design of many PvE MMO's is getting tired and boring. It usually goes something like this: Level to cap, Raid Treadmill, repeat. As other have said, it is essentially 2 games. It also has the side effect of mudflation and trivializing of old content. Solution. 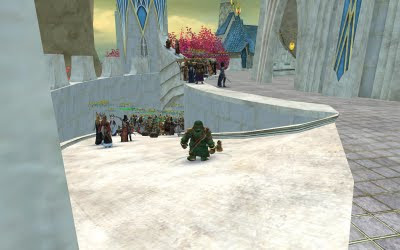 Traditional MMO's have a progression, but it is all back-loaded in their raid treadmill. Instead, I think the progression should be dispersed throughout the game. To accomplish that, my MMO would used "staged releases." Let's use WoW as an example. When they launched, they had 60 levels and a raid. Naturally, many wanted to get to the raid and sped through. Seems to be human nature. What is a staged release? My design would only have the game launch with the starting areas and maybe another zone. Then, 2 - 3 weeks later another zone would open. A few weeks after that, another. Lets say Westfall is the highest level zone at launch (for the Alliance). Deadmines would still be there, but now it would be the end game dungeon/raid for a length of time. It should be available in 5 or 10 man versions. All dungeons and raids would have their time as the end game instance. Over a year period you would dole out the content one chunk at a time. An 'epic' story would be crafted to guide players to the new zones/frontiers. After a year, expansion pack time and you continue the trend. As the game is released in stages, new players should be able to catch up pretty easily. A mentoring system would be required and would also help keep older instances alive. More on how to non-trivialize them later. Pitfalls. In order to keep players from getting bored, horizontal content would be very important. The game would need Achievements, Crafting and Collections. At every stage, more of that horizontal content would be added. It should be enough to keep the 'average' person busy until the next stage. 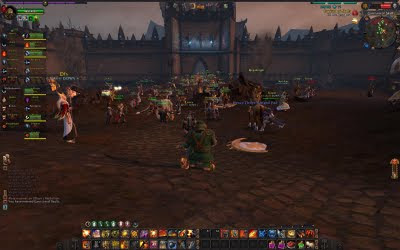 Itemization may be an issue as the raids would be spread out and not at the level cap. My solution to that is tokens and level adjustments. All dungeons/raids would drop tokens (in addition to loot) to players of the appropriate level. These can be traded in for gear and such. EQ2 will be introducing a level-reduction system, so you can lower yourself to make content more meaningful. That would work great here, so you can go back and run old instances and get the tokens to spend on new gear. Hopefully this will keep many of the old dungeons/raids alive for a long time. Conclusion. Players love new content, but it is not easy to keep up with the demand. Using a Staged progression, a MMO will always seem new and dynamic as there is not long to wait for something new. Gone would be the days of sitting at the level cap running that raid treadmill. With this design you would constantly be progressing while keeping the old content useful. Well, that is my MMO design idea. I'm sure it has some flaws, but it sounds fun to me and I'm not even a big PvE person. 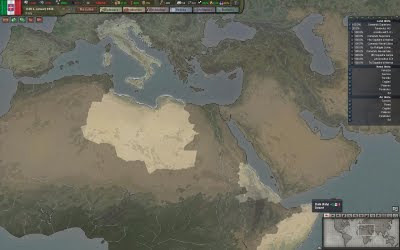 Part 4 of the Fallen Earth Walkthrough is up. This time we go deeper into skills and combat. This may be the last of the videos. It is still in beta, but as I am considering purchasing the game I do not want to see too much before it even launches. Then again, I may try to check out PvP and that could be another video. Part 3 was uploaded and processed a bit quicker than I thought, so it is an early edition. In this video I go over some basic information about skills and crafting. There is also some crossbow action. This video starts a bit abruptly. My intro clip was causing the video software to crash and had to be deleted. Lucky for me it crashed near the start and not near the end. 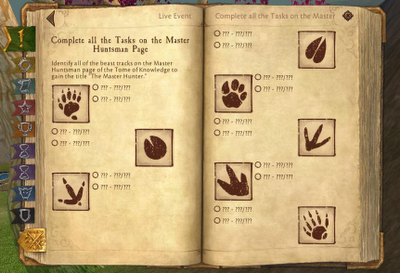 In the 2nd part of the Fallen Earth Walkthrough (Part 1) we see some more of the tutorial. It starts to get a bit more interesting as there is some fighting. Youtube is taking its time with the HD version, it should be there sometime. On Friday night, a PTS Event was held for WAR called the Battle Royal. Originally it was supposed to be Thursday night, but it was delayed. The purpose of the event was to test the new ramps that were added to tier 4 keeps. The event moved from zone to zone testing out every keep. Each realm would defend and attack the keep. It was organized by Mythic personnel and turned out to be pretty fun. After each zone, they handed out a special mount at random. A lot more people showed up than I thought would. The estimates I heard put the total at 220+. The performance was actually pretty good. I had to go down to the Balanced graphic setting, but it was playable. There was some lag though. I think that the added ramps will be both good and bad for the game. On the positive side, they will make large battles much more fun. There is more room to move around which will add an element of strategy. Sure, the 2nd ramp does not make much sense if you look at it from a real world perspective. This is a game though and sometimes things must be done for gameplay reasons. The downside is that I think this will make defending the keep much more difficult for smaller groups. Prior to the added ramp, a smaller (but still large) group could field a tank wall and hold off a larger force. Now that same force would no longer be able to use that same tactic. Players are very creative. I would not be surprised if smaller groups are able to use the multiple ramps to their advantage. I've been on fortress raids which were wiped by much smaller groups because they dropped off the ledge and attacked us from behind. This type of strategy may work here as well. You should expect this change (and the city siege changes) to go live pretty soon, as the pre-patch has been up for download. 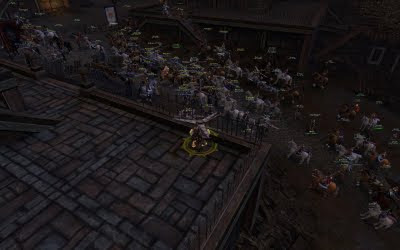 It should be interesting as keep and city sieges will be quite a bit different. September is fast approaching. Three MMO's will be launching during the month: Champions Online, Fallen Earth and Aion. CO and Aion are probably the top two contenders for the month though. I've played both of them and would gauge my interest in them to be about equal. Aion has the Abyss which may provide some fun PvP. It is also a polished MMO with a lot of content. However it is Eastern themed and has wings. Champions Online has a lot of customization options and is about super-heroes. I can also get into the Star Trek Online Beta. However it is a new MMO and will likely have all of the problems a new MMO usually does. Next week, when the NDA drops I can talk more about it. As for Fallen Earth, I just don't know enough about the game to consider it. They are holding an open beta next week, hopefully I will get a chance to check it out. Are you pre-ordering one, both or Fallen Earth? There are more vanity pets than monsters. Jewels seem to be the largest profession. And coming soon: You can play a Werewolf. I'm sorry, I guess they are called Worgen in WoW. A were...Worgen is just one step away from a Vampire. That's right, Blizzard is setting up to release a playable Vampire class. With the popularity of Twilight and the new abundance of high-school vampire shows on TV, why wouldn't Blizzard want a piece of the action? Some of my fellow CoW's rolled Destruction characters on Iron Rock in order to play against our members there. I am always up for beating down a guildy, so I rolled a Shaman. They are close to Dwarf like I suppose. I also never played an Archmage much, so it would be a different experience. Iron Rock turns out to be a pretty good server for me. While Badlands is still #1 for me, there is activity at different time on Iron Rock. For example, weekend mornings are a time when I get a chance to play. Badlands is not very active while Iron Rock is. This should maximize the fighting, which should be a goal for us all in WAR. Playing Destruction is tough though. yesterday i was in a scenario and this Swordmaster ran up to me and started to attack. "What the heck is this guy doing?" I thought to myself. "Oh yeah... I'm on the other team now". Another plus is that I was able to secure the name Werit on Iron Rock. It's been fun so far. Greenskins seem to have a lot of flavor and say some funny things. 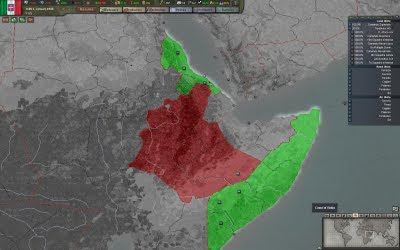 The War with Ethiopia was over by May. 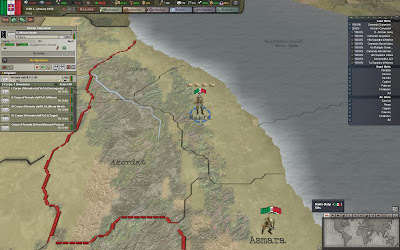 Superior Italian forces captured Addis Abba without too much trouble. On the southern front the Ethiopians did manage to make some advances. In the end though, they surrendered once we reached the capital. I had a screenshot, but it was lost in my move to a new OS. 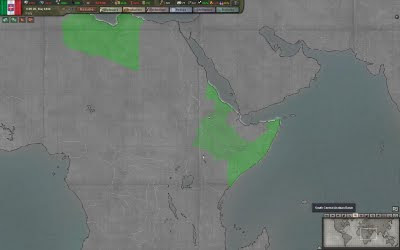 However, here is what Italian East Africa looks like now. Now I can tell any of these commands to do stuff without all of the micromanagement. However, I do need to transfer a large chunk of the EAC to the NAC. 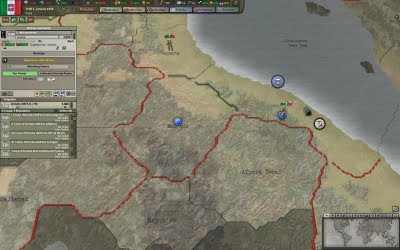 The bulk of my African forces should be in the North. That is where most of the action will come in the future. 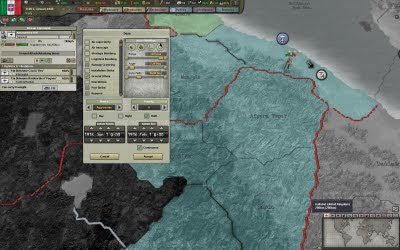 I give orders for the NAC to defend points in its theater and for the EAC to defend several key provinces in Ethiopia. 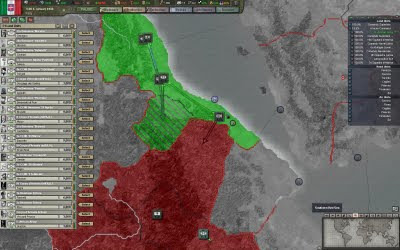 The are still a large amount of NAC forces in Ethiopia, so the AI takes care of loading them onto ships and getting them where they are needed. Now back to production. The Theater commanders tell you what they need (or rather want) to get their job done. Of course there isn't enough to go around, so i have to makes some tough decisions. One thing I did not do, is assign the EAC some transports and air support. I move over some units. All I have to do is assign them a unit in Italy, and they will send that transport out to get him. 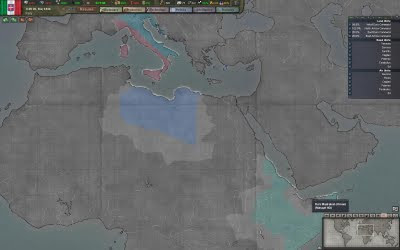 As we ended last time, Italy is currently at war with Ethiopia. We have made some inroads into their territory, but much remains to be done. Here is how the conflict looks now. 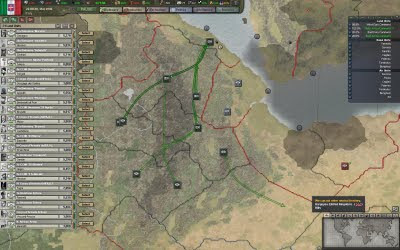 The East African Army (EAA) is currently resposible for our war effort there. General Grazioli currently commands the army (leaders have bonuses). He reports to African Command. I should note, that this hierarchy is all customizable. You can build them and name them how you want. This is important because I can give orders at any level and they will filter down. This way you can have the AI deal with things you would rather not. The EAA is currently comprised of 6 corps and a division. I also have several naval units and air wings for support. Let's get this war going. I am going to give the orders to the EAA rather than do everything myself. Here I set up the order. I want them to take Addis Abba, the capital. I also gave orders for my air support. They will be patrolling the blue area for targets. And as we can see, the AI has started to take care of business. I could easily do this myself, but I thought it'd be fun to delegate. It is a shame that my air cover cannot reach too far into Ethiopia. I think I will research plane fuel tanks next. Next time, we will see how the war went. Yesterday Hearts of Iron 3 arrived. 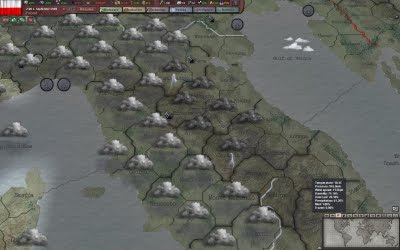 I had long decided that my first campaign would be as Italy in 1936. Italy, for me, is a nice starting point. It is not as big as Germany, USSR and the other major players, but still matters. It also gets to participate in all facets of the war: air, land and sea. My long term goals for Italy are to conquer much of what was the Roman Empire. Below you can see what Italy looks like in 1936. Electronics and Mechanical Engineering. This will lead to Radar, improved communications and better industry. Small Arms. 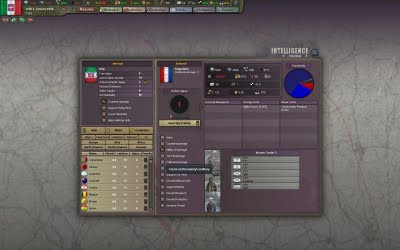 As Italy makes wide use of infantry, they should be better equipped. Light Tank Gun. Who doesn't like tanks? In the coming years, we are going to need better ones. Air Frame. Air power is the future, so let's improve how our fighters are built. Next up is production. We already have a submarine being built and a Light Cruiser. This is taking up a sizable portion of the money set aside to build. With what is left, I order 2 new infantry brigades to be created. Intelligence is an important part of any strategy. As I have plans for Yugoslavia, I have made them a priority for my agencies. I want to know the strength and whereabouts of their military. That was pretty much my first 30 minutes in the game. Next time we will address Italy's current war with Ethiopia. 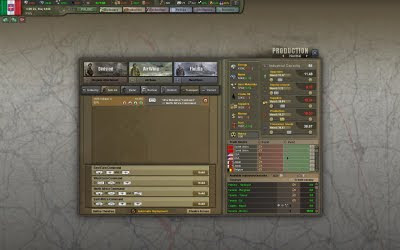 The fine folks at Paradox Interactive released a demo for their upcoming World War 2 strategy game, Hearts of Iron 3. 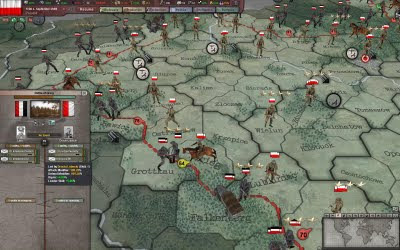 If you have not played previous iterations, it is a grand strategy game that focuses on the entire world at the time. The fighting is abstracted so there are no Total War 3d battles. The strength of the series has always been it's scope. You can play any country at the time, although some might be pretty boring (i.e. Cuba). Politics, Military, Production, Logistics are all under your control. The latest entry in the series build upon it even more. Dare I say this could be the most comprehensive WW2 game ever? 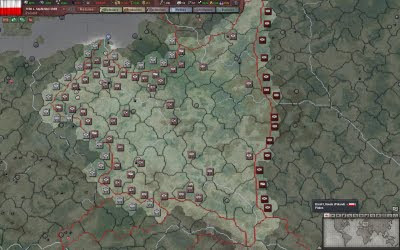 For the demo I chose to play Poland. The demo starts on the first day of the war in 1939. In the full version I will start at 1936. We don't really stand a chance at this point, as Germany is about to steamroll us. The zoomed out looks uses counters, if we zoom in close we get a different view. If you are a fan of using counters all the time, you can do that too. 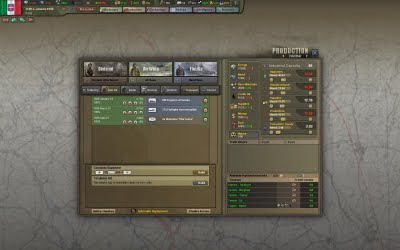 There is also a full weather system in the game which effects all sorts of things like movement, logistics and combat. It has it's own map overlay. As we can see, there are some heavy storms in Italy. 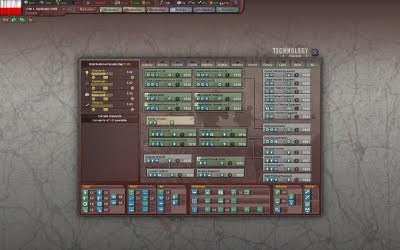 The technology (research) in HoI 3 is pretty extensive and customizable. You don't research new units, you research components, like a tank gun. 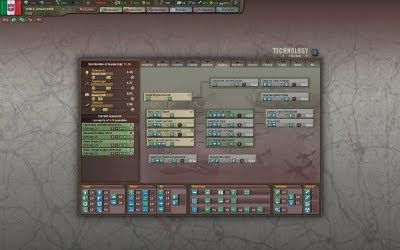 Then you pretty much just build your new unit so there is a lot of customization. And lastly, a picture of combat. It may not look like much but there is a lot of detail. The terrain, technology, leadership, doctrines (strategies), weather and time of day all go into deciding the battle. When I get the full game, I will cover more of that in depth. 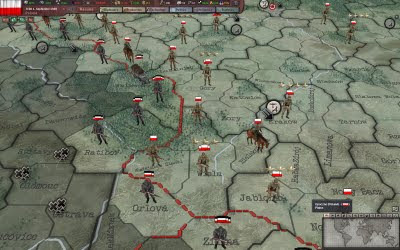 HoI 3 should be available in stores/online anytime now. Hopefully my copy will arrive soon. When it does you can expect a campaign report as I take control of Italy.